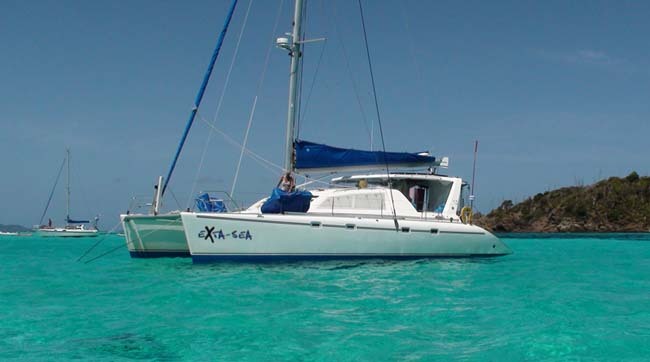 EXTA-SEA is offering a SUPER SUMMER "SAIL" - Available till end October 2013. EXTA-SEA will be available for charters throughout the summer months, in the BVI's, and planning on locating to the Grenadines from mid July till end October. (On this we are flexible). Extasea's accommodations are luxurious and the volume of the cabins is similar to those found on much larger yachts. The immediate impression upon boarding is one of spaciousness and generous headroom. The saloon is spacious and elegantly proportioned with a large seating area, and an attractive beech-wood table which can be lowered and made into a king size bed - great for the little ones, where they can safely sleep or play close to the action. Her two "sugar scoop" swim platforms make boarding a snap.